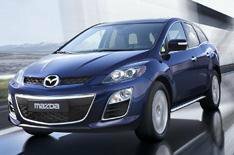 New super-clean Mazda CX-7 diesel | What Car? Mazda's face-lifted CX-7 is expected to feature a new system to reduce harmful exhaust gases when it goes on sale in the UK later in 2009. The Japanese version of the car will be Mazda's first production model to feature its urea selective catalytic reduction (SCR) system, and our sources suggest that UK cars are likely to get the same system. The SCR system works by spraying aqueous urea a substance commonly used in lotions and hand creams directly into the exhaust, where a chemical reaction neutralises nitrous oxides (NOx), which have been linked to breathing problems and local pollution. Mazda says that due to the extra equipment required, the use of such systems has been limited to its commercial vehicles, but because the CX-7 range has a new 2.2-litre diesel engine that produces low NOx volumes, only a small additional tank is required. Although it reduces NOx emissions, the SCR system will not cut CO2 emissions.